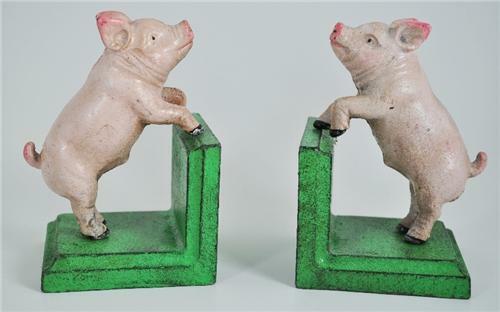 Pink Pigs standing on Green Bases. The pigs are screwed into the base from the bottom. They are quite heavy for their size weighing over 4½ pounds! This item will ship at NO COST TO YOU, USPS Priority Mail for fast and safe delivery to your door! so you may track your purchase. Our goal is integrity, honesty, and a fair price with nothing less than total satisfaction for your purchases. We always answer any questions or needs immediately. Thank you for shopping with Andtiques.com!